Learning roots knows how you feel because, hey, we all have been there too. What we really need is a way to both excite and educate our children about Ramadan in a way that endears their hearts to the great month and shows its blessings as a golden opportunity for them to get closer to Allah. That’s exactly why the Learning Roots Ramadan Activity Book was designed. These books were designed at mainstream quality standards with Ramadan in mind from the ground up. 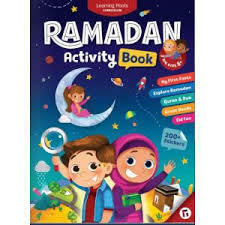 The book contains an outpour of children having fun practising Islam in an environment and context they can relate to. The activities included are both practical and contextualised so your child will learn not just about the do’s and don’ts of Ramadan, but also how Ramadan affects their lives, their environment and the world around them. There are two different age ranges so you can find the right level for your child. This particular book is suitable for children who can read independently. We suggest this book is suitable for children aged 8+ but every child is different!